In The Woman on Platform No. 8 by Ruskin Bond we have the theme of identity, kindness, freedom, independence, loss, trust and connection. Taken from his Collected Short Stories collection the story is narrated in the first person by a man called Arun who is recalling an incident when he was twelve years old. In which he encountered a woman at the train station who not only showed him kindness but who he never really got to know. 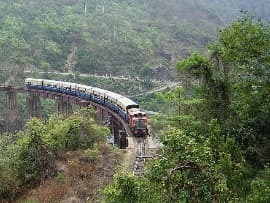 Her name or occupation was a mystery to Arun and the only hint that the reader gets as to the woman’s identity is when the young child runs across the railway tracks in the station and the woman firmly hold Arun’s arm. It is possible that the woman is a mother who lost her own child at the station and as such is protective of other children who are alone and who pass through the station. Having experienced the loss of a child the woman may spend her time at the station ensuring that the same does not occur to another child. What is also interesting about the story is the fact that Arun is so trusting of the woman and how she is dressed appears to have an influence on Arun. The woman is dressed solely in a white sari and Bond may be using the woman’s appearance to symbolically suggest that she is of good will. That there is a purity within the woman and that she will not be a negative force on Arun’s life during her brief encounter with Arun. Something that is clear to the reader as the story progresses. The woman also puts Arun before herself when she offers to feed and look after him while he is waiting for the train. Again there is a sense that Arun is trusting of the woman. Even though he has no idea who she is Arun feels as though he has to respect the woman due to the simplicity of her dress and the fact that she is kind towards him. Though he does initially have suspicions about the woman. However when he is eating his food his suspicions disappear and he is comfortable in the woman’s presence. If anything Arun knows that the woman is not a threat to him. Her primary concern as the reader understands it (and Arun too) is that she is concerned that Arun will be okay while he is alone in the station. Satish’s mother is an interesting character as she acts as one would expect a mother to act. She is putting Satish first and making sure that he will be okay. However her interference when it comes to Arun is not only annoying to Arun but is the trigger for the woman to tell Satish’s mother that she is Arun’s mother. Though this is a lie it connects Arun further to the woman and puts him at ease. Allowing him the ability to take the stance he does towards Satish’s mother. He does not have to agree with her as the woman is fully behind anything that Arun may say. If anything Arun is showing an independent streak though at the same time he has become reliant on the woman. She has ensured that everything is okay and by backing up Arun with regard to Satish’s mother. Arun finds a degree of freedom to express himself. Which he does by kissing the woman on the cheek before the train leaves the station. This act may be important as not only does it again connect Arun with the woman but it suggests that Arun is grateful of the woman’s actions with regards to how she has treated him. The end of the story is interesting as very little appears to happen. However Arun has learnt a valuable lesson. By trusting his instinct with regard to the woman Arun knows that he made the right decision. Though he may never meet the woman again he will be grateful for her intervention in what was previously a lonely experience for Arun. He was in a world in whereby he was unrecognized and at times forced out of the station when it was busy. With the woman’s help he was able to stand on his own two feet. The benefit of which was he was able to comfortably disagree with Satish’s mother without the fear of retribution from the woman. If anything the woman again allowed Arun his own sense of freedom while at the same time being careful not to be overprotective. Something which Satish’s mother might do well to learn from. However the reader does feel an element of pity for the woman at the end of the story. Though we don’t know her true identity and are left to assume she has lost a child at the station. There is a feeling that the woman’s life is dedicated to looking after other children at the station. Being unable to move on from her own loss. McManus, Dermot. "The Woman on Platform No. 8 by Ruskin Bond." The Sitting Bee. The Sitting Bee, 17 Oct. 2018. Web.